The first President was Monty Spinker. 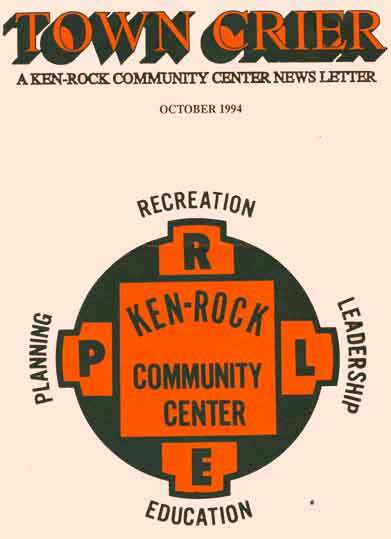 The dues were $16.50 per year was established with a donation to help with the cost of renting a room at Ken-Rock. 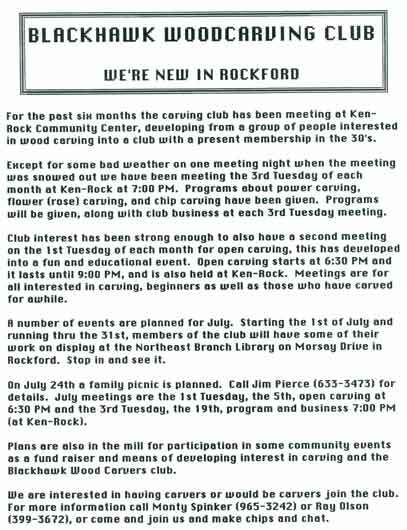 Gordy Moscinski taught carving classes at Ken-Rock Community Center through Rock Valley College adult education. The newsletter was sent out with Ken-Rock's Town Crier. In July the club began editing and sending the newsletter. The club also, had a booth at Beattie Park craft show. Delores Cascio broke her leg at a carving class in Madison, Wi. summer of 1994. Carving night was the 1st Tuesday and 3rd Tuesday of the month. The 3rd Tuesday was business meeting and program night. December meeting is clubs Christmas Party. Refreshments and swap tools and etc. A GREAT program is in store for us this Tuesday, July 19, 1994!! LARRY ERICKSON of the Kishwaukee Carver’s Club will be our program. Larry recently competed in the International Carver's Show held in Davenport, Iowa. YOU WON'T WANT TO MISS THIS MEETING!! I f you know anyone who would put on a program for one of our Tuesday night meetings, pI ease contact Rich Anderson or Lloyd Duerst. To all Blackhawk Wood Carvers and their families – - There will be a picnic on SUNDAY, JULY 24 from 12:00 pm to 5:00 pm at RUEBEN ALDEEN PARK on North Alpine Road. If you are planning to attend, please bring your own meat dish, drinks/and table setting. Also, bring a dish to share with the rest of those attending. Please plan to come and enjoy the afternoon with fellow carvers. Bring something to work on if you wish, but there is no electricity so it's strictly knives and chisels. If you plan on cooking at the park, there is one large grill at the site, but if you have a portable grill, you might want to bring it along. The shelter house is to the right when you come to the fork in the road. THANKS TO OUR PICNIC COMMITTEE -- JIM PEARCE, GUY DEVITA AND RAY OLSEN!!! As you know, we will have a booth at the Art Fair in Beattie Park on Saturday, September 10th and Sunday, September 11th. We need volunteers to work the booth. We'll have a sign up sheet, so please mark your calendars!!! Don't forget. we need ideas and small carvings to sell. They are needed by the 1st Tuesday in September. Also, on Saturday, August 6th at 1:00 pm we would like to put our imaginations together and figure a structure for a booth. Monte Spinker has volunteered his place -- 6872 Safford Road (corner of Safford and Meridian Roads). Phone 965-3242. SEE YOU THERE!!! Another GREAT program has been set up for us by Rich Anderson and Lloyd Duerst on Tuesday, August 16th. We will have Dean Mohring of Rockton, Illinois. Dean, a former wood carver has started his own saw mill in Rockton. He will be showing us all the different types of woods and the best qualities of each. .
DON'T MISS THIS PROGRAM!! It should answer many questions we have about wood. We've had to cancel our Saturday, August 6th get together to figure out a booth for the art show in September. We will set up another time. WE MISSED YOU ! ! ! If you didn't make the picnic, you missed a great time ! Thanks again to our picnic committee: Jim Pearce. Tony DeVita and Ray Olson. The weather was good, the food was great ... and we even had "entertainment". We will have a sign up sheet for times you can work at the Beattie Park Art Fair on Saturday, September 10th and Sunday, September 11th. Don't forget --- we need ideas and small carvings to sell. We will be collecting them at our August 16th meeting. PLEASE HELP ! On Tuesday, August 9th, there will be a carving demonstration at the Byron Forest Preserve. We will be leaving Kenrock parking lot at 6:15 P.M. This sounds like it could be an interesting program. Try to meet us. 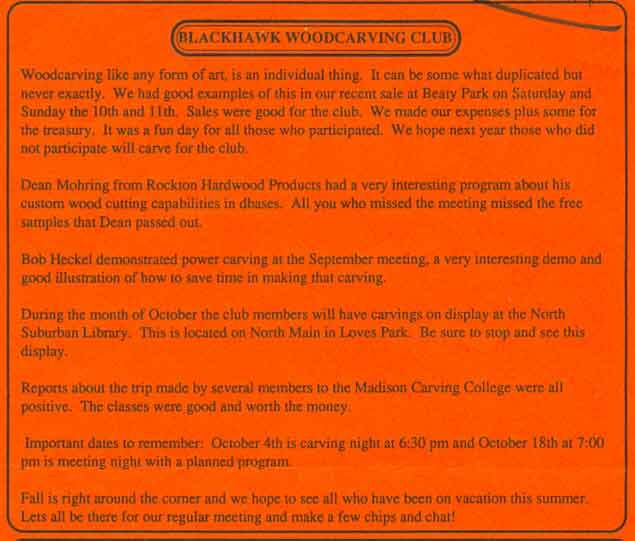 The program for Tuesday, September 20, 1994 will be a power carving demonstration by Bob Heckel. Bob plans to take a project from beginning to end. I’m sure you don’t want to miss it ! In all accounts, the Art Fair wasn't only fun ... but we made a profit! Thanks to all who gave of their time to help out at the Booth at Beattie Park and for contributing items to sell. A special thanks to Bob Heckel, who not only contributed birdhouses and other items, but was there every hour and helped with setting up and taking down of the booth. Once again, Bob ... Thanks!!! For those of you that missed this, we'd like to do it again next year. Ray Olson has been able to get the Loves Park Library to display our carvings. Please bring your best pieces you would like displayed to our Tuesday, September 20, 1994 meeting . It would be nice if everyone had at least one piece. For those of you that don't watch Channel 13 News, "our Carving Club" was featured by Diane Mocha on Friday, August 18, 1994. It was only a 2 or 3 minute spot. but it did let some people know we have a club in town.